Mister Twister's G-Grub and other soft-plastic creature baits often nab big summer bass when other lures fail. I have this bassing buddy who’s always fishing with lures that are exceedingly weird and ugly. Last summer we were on the water and he tied on this glowing thing with claws and bizarre appendages that resembled something you might see squirming in a Chernobyl sewer. “A Cabela’s Creature Bait,” he replied. He pitched the extraterrestrial under a dock and seconds later hooked a 5-pound largemouth. The next bass he caught, on the same lure, was even bigger. “It’s beyond me why a bass will eat something that strange-looking,” I said. I suppose it doesn’t really matter why bass go for these mutants. What matters is they do. My pal has proven it repeatedly. So if you’ve been reluctant to try ugly lures, tie one on next time you go fishing. Your buddies may snigger, but you’ll have the last laugh. Here are four of my personal favorites. It’s ugly for sure. Cabela’s Go-To Creature Bait looks like a cross between an alien crawdad and an octopus. It has two little arms, two curly legs and two wing-like things protruding from its tubular body... It looks like something a deep-sea submersible might come across in the darkness 10,000 feet down. Texas rig it to work shady vegetative cover such as lily pads or pockets in coontail, or use it on a Carolina rig to fish deep, dark, open-water structure such as rock humps and channel drops. Bring the lure in with a twitchy crayfish-like retrieve, and hold your rod tight so it doesn’t get deep-sixed when a lunker chows down on this big ugly. Dynamite! Available in eight colors and 4- or 6-inch size. Get it at www.cabela’s.com. Yamamoto’s Flappin’ Hog has some loyal fans despite being as ugly as …well, as ugly as a wart on a hog. One angler who loves it is Terry Fitzpatrick of Waukon, Iowa. He used the Hog to turn in an impressive showing in the 2009 Bassmaster Classic on the Red River near Shreveport-Bossier City, Louisiana, finishing 17th overall with a three-day total of 39 pounds, 15 ounces. He used only two different lures: the Flappin’ Hog and a Terminator spinnerbait. 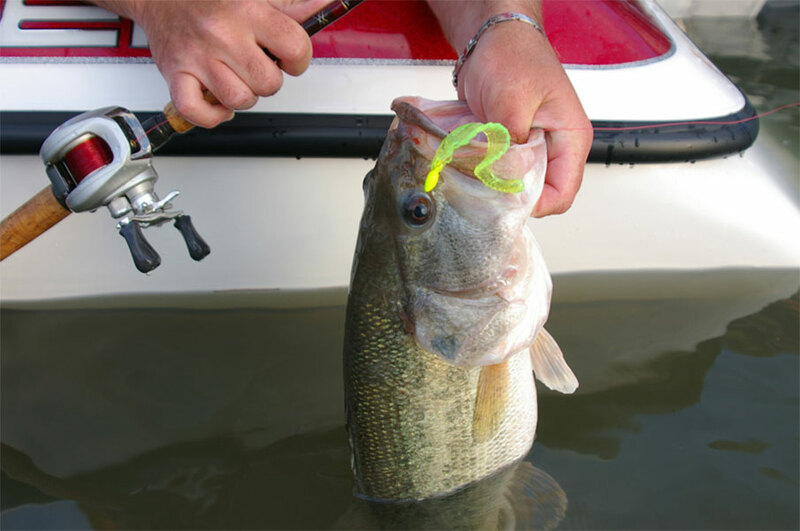 The Flappin’ Hog is outstanding when Texas rigged for thick cover or Carolina rigged for bottom-hugging bass. Use it with any jighead or add it to your favorite flippin’ jig and you have a winning fish-catching combination. Strikes are explosive. Comes in 15 colors and 3-3/4 or 4-1/2-inch sizes. Find it at www.baits.com. The G-Grub’s jagged fins run from its head to its tail, producing a bait that resembles a mutant razorback leech. But these fins produce an undulating action bass find hard to ignore. Pair a 3-inch G-Grub with a 1/8- or 1/4-ounce jighead, and 4-inch models with a 1/4- or 3/8-ounce jighead. You can rig with the hook point coming out in the middle of the fins or on the opposite side; either way, it produces the same great fish-attracting action. Cast the G-Grub and retrieve it slowly parallel to weedlines or past logs, stick-ups, rocks and other sparse cover. It’s also great for dipping slick, “pole” timber in water as deep as 20 feet. Let the G-Grub sink to the bottom beside the timber and allow it to sit a minute before moving it. If bass don’t respond, bring the lure up just fast enough so the fins ripple through the water. Fish it slowly all the way around the pole, and if a bite isn’t forthcoming, move to the next pole. Working all poles in an area almost certainly will produce several bass. Features include a rattle chamber in the tail that adds sound. Available in 3- and 4-inch sizes and seven colors. Visit www.mistertwister.com. The incredibly ugly Stone Cat looks like some freakish cross between a catfish with swollen whiskers and a huge, fat tadpole. There are tentacles at the front and a flipper-like tail at the rear. Hooked up on a Carolina rig or pitched into heavy cover on a Texas rig, the lure dances and creates a disturbance big largemouths lock in on. Because it superficially resembles a madtom or sculpin, the Stone Cat is a great smallmouth lure, too. Anglers have a choice of 10 effective colors for this 5-inch lure. Visit www.venomlures.com.